Guess what is in this 50-pound monster pannier. 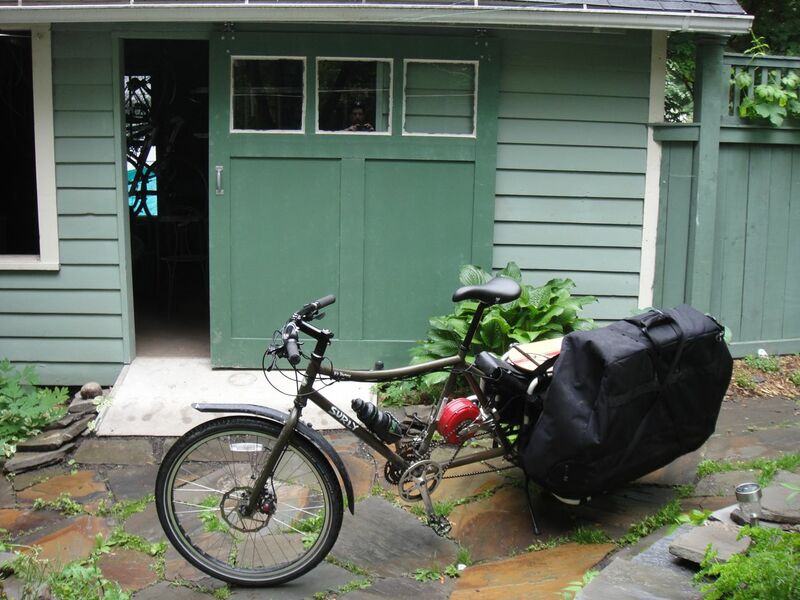 Us cargo bikers get a thrill out of telling everyone what big loads we can carry (see Their Carrying Capacity and My Carrying Capacity). I am no exception. Here are some of my latest big loads. Toting my video camera, tripod, several laptops, and modeling clay to South Hill School for my claymation PTA enrichment class. Final product is at http://www.youtube.com/watch?v=xsZcRHJo8Wc. The whole family heads down the rec way to the swimming hole. I am carrying 120-pound Jasper on my bike. Thea and I dismantled the Burning Man-style geodesic dome I built for Quaker Camp. This is the heaviest load I’ve carried (400 lbs. of dome and people). It was unstable but we made it home. Here’s the dome in use back in 2006. Amazing something this large can fit on a bicycle!